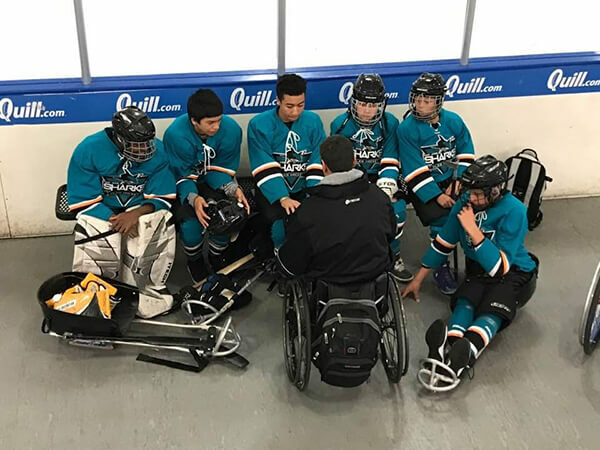 This weekend, USA Hockey hosted the 2017 Disabled Hockey Festival in San Jose. Over 60 teams in ten divisions competed over four days of competition. 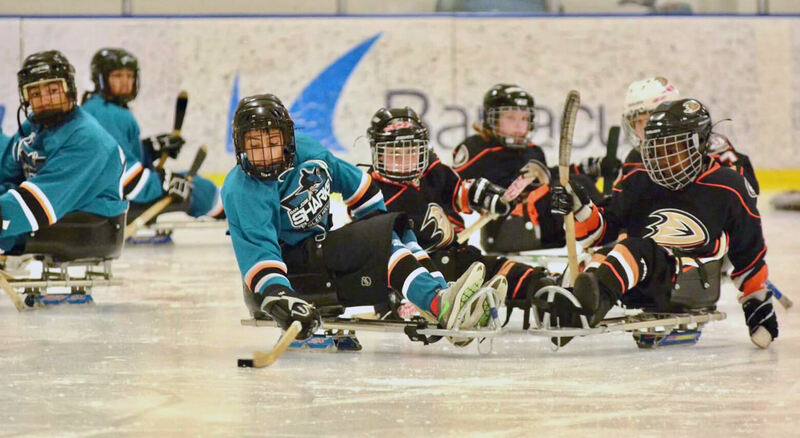 BORP’s youth team, the Sharks Sled Hockey team faced off in the Youth – C Division in their first formal competition of this kind. The kids started with a 6-1 victory over San Diego to set the tone for the tournament. Garnett Silver-Hall used his speed on both ends of the ice to control the tempo, scoring his first hat trick (3 goals) in his young career. Eyan Gilder played great in goal and only allowed a fluke goal when he tried to clear the puck and it hit his own sled and banked in. The next game would be a bigger test for the team. The Hornets from Chicago were a huge team with a ton of speed and great hockey sense. The Sharks outworked them in the corners and took advantage of defensive breakdowns by the Hornets. Garnett started the team off with two goals in the first period, with Parker Berry adding one more before the end of the period. The Hornets came back to get a goal in the 2nd period, but could not get another one past Eyan. Jacob Ramirez got one more in the 3rd period, and Ben Thornton and Thomas played great defense to secure a 4-1 victory. The next game would decide if the Sharks would advance to the finals. The team faced an incredibly well coached team from Wisconsin, with an very fast, disciplined team. The teams both played great defense in the first period and shut each other down. In the 2nd period, Wisconsin got on track and took a 2-0 lead before the Sharks could get on the board. Garnett was able to get one past the goalie midway through the period to cut the lead to a single goal. 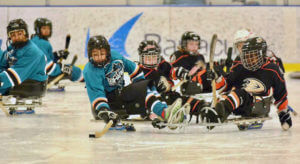 The Sharks continued to push the pace but could not get anything past their veteran goalie. Finally, midway through the third period Garnett was able to tie the game with an assist from Thomas Giovanola. 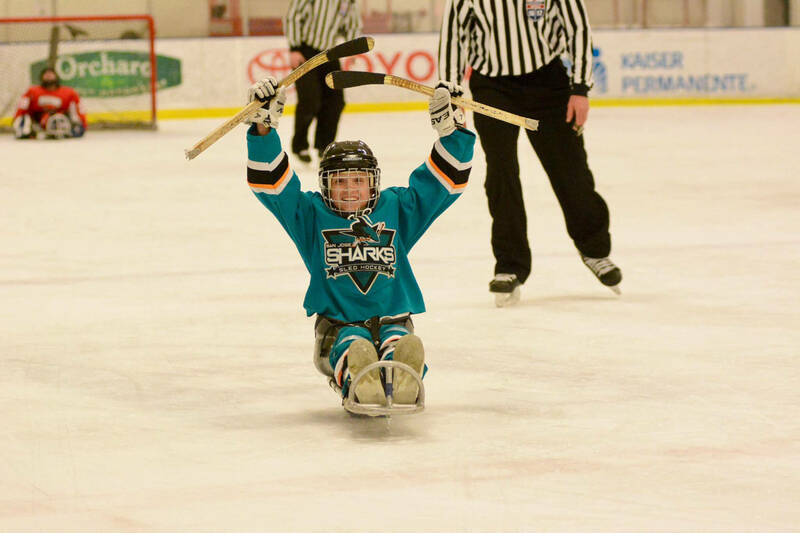 Thomas is the smallest and youngest player on the team at only 10 years old. He had been skating his heart out and made the perfect pass up the boards to break Garnett free. During the last part of the 3rd period, the Sharks swarmed the Skeeters from Wisconsin, but the goalie would not let anything past him and the game ended in a tie, requiring a shootout. During the shootout, Eyan built a wall, stopping the first two shooters. Garnett was stopped by the Skeeter’s goalie and our 2nd shooter was up. Thomas took his time on the approach and gave the goalie time to overthink things. Thomas placed the puck perfectly in the left corner and the goalie could not reach it, giving the Sharks the lead in the shootout. In the final shot, Eyan adjusted perfectly and took the shot in the ribs to keep the puck out of the net, giving the Sharks the win and sending them to the Championship game. 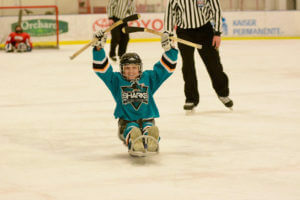 The Championship game would be a rematch between the Sharks and the Chicago Hornets. A tough, well played first period left the game at 0-0. Jacob Ramirez and Ben Thornton played incredible defense, limiting and chances for the Hornets to score. Parker, Thomas and Garnett forced the action on the offensive end but their goalie played great and stopped all our chances. In the 2nd period, Garnett took over. Using his speed to blow past the defense on the left side, Garnett curled back up in front of the net and finally put one past the goalie to get the Sharks the lead. Off the face off, Garnett got the puck to Parker and attacked the left side again. Parker made a perfect pass to get the puck back up to Garnett and he blew past the defense again and got his 2nd goal of the period. Garnett added one more goal in the 2nd to get his 2nd hat trick of the tournament off another assist from Parker. Jacob, Ben, and Eyan shut down the defensive end of the ice and Thomas made some great plays on both ends of the ice. 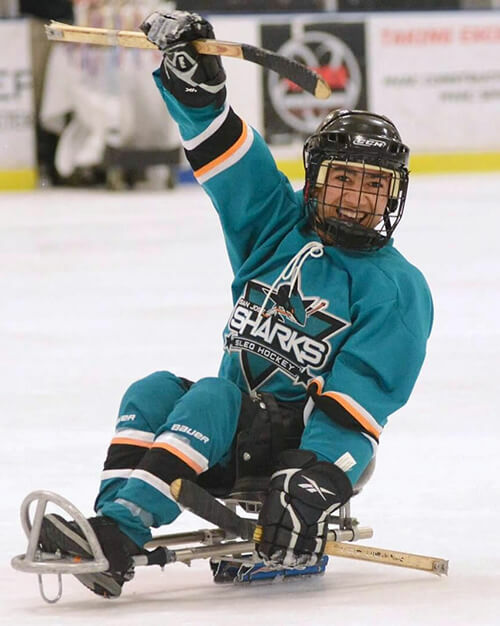 With this victory, the Sharks Sled Hockey team secured the 2017 USA Hockey, Disabled Hockey Festival Youth C Division National Champion title. Congratulations to Garnett Silver-Hall, Thomas Giovanola, Parker Berry, Jacob Ramirez, Ben Thornton, and Eyan (the wall) Gilder for an amazing weekend. Thanks to all the parents that helped with all the gear, shuffling kids, and more. Next year we go to Chicago to defend the title!! Congratulations to all the kids, coaches, parents, grandparents and friends and for the memories that will last a lifetime. A fantastic experience.